Full of gorgeous color and light, this cityscape tapestry "Grand Canal" shows a scene of Venice and its life on the canals. The city of Venice is a wonder of the world, in that it consists of hundreds of islands all interconnected by bridges and navigated by boats and gondolas for transport of people as well as cargo. The play of light on the water is delightful, as is the play of the golden sunlight on the buildings themselves, reflecting the peach clouds of the afternoon sky. 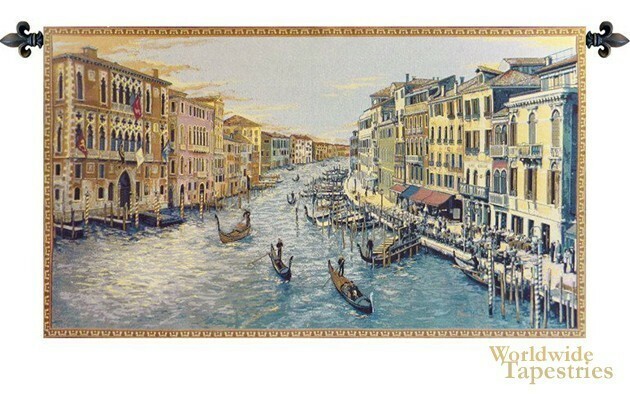 This cityscape tapestry "Grand Canal" is backed with a lining and has a tunnel for ease of hanging. Note: tapestry rods and tassels, where pictured, are not included in the price.